The undergraduate degree in Medicine in Trinity College Dublin is a 5-year programme which is accredited by the Irish Medical Council in accordance with the guidelines set by the World Federation of Medical Education. The School clearly defines the educational outcomes that students should exhibit on graduation and these are combined with the graduate attributes expected from all Trinity Students.. The graduate outcomes are expressed in three domains congruent with the Medical Councils three Pillars of Professional Practice: The doctor as a Scientist and Scholar, the doctor as a Practitioner and the doctor as a Professional. These principles impact on and are reflected in all elements of the curriculum and at all points. On completion of the final year of the programme, the graduating student must be competent to facilitate the delivery of patient care in the Hospital setting to the highest standards. We consider that the following components are essential in order to achieve this aim. The School of Medicine of Trinity College Dublin has been training doctors since 1711. We’ve evolved to become a Top 100, state of the art Modern Medical School. To achieve this we’ve developed a panel of Graduate Attributed we wish to achieve and these are listed below. 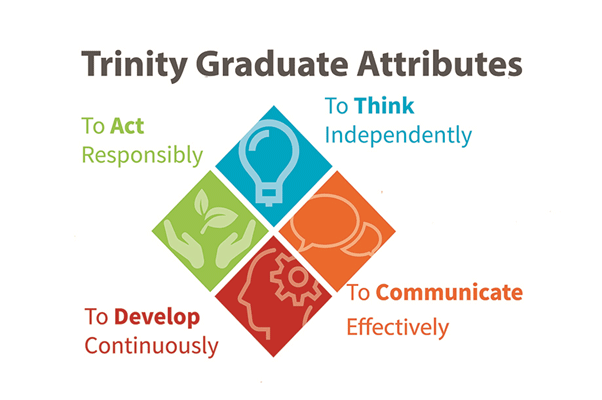 These Attributes combine with those of the Trinity Education Project to help us create a pattern for what we believe the Knowledge, Skills and Attitudes a Trinity medical graduate should have. the clinical and basic sciences and the behavioural and social sciences, and be able to integrate and critically evaluate evidence from all these sources to provide a firm foundation for medical practice. biological variation of disease, and have an understanding of scientific methods, including both the technical and ethical principles used when designing experiments. the range of alternative and complementary therapies. The reason why some patients use them, and how these might affect other types of treatment that patients are receiving. the issues and techniques involved in studying the effect of diseases on communities and individuals, including genetic, environmental and social causes of disease. gain, assess, apply and integrate new knowledge and have the ability to adapt to changing circumstances throughout their professional life. source, evaluate and prioritise new information. be aware of the psychological effect that illness can have on patients and their families and how the behavioural sciences including psychology can be used help the understanding of their condition and can facilitate their compliance with treatment plans. apply the principles of good patient management. be aware of issues such as alcohol and drug abuse, domestic violence and abuse of the vulnerable individuals. Be aware of the over-riding importance of ethical principles in bio-medical research. the principles of good medical practice as set out by the Medical Council. The principles of disease aetiology and pathogenesis, mechanisms diagnosis and management. the rights of patients statutory requirements regarding patient consent e.g. who is appropriate and capable of making an informed decision. the role that lifestyle, including diet and nutrition, can play in promoting health and preventing disease. the principles of promotion of health and prevention of disease. the health hazards of medical practice, the importance of their own health and the effect that their health has on their ability to practice safely and effectively as a doctor. the relationship between the environment (economic, cultural, geographic, etc) and the practice of medicine. take and record a patient's history, including their family history. perform a full physical examination and an assessment of mental state. interpret the findings from the history, the physical examination, and the mental-state examination to construct a differential diagnosis . decide on range of investigations required. interpret the results of commonly used investigations including radiology and electrocardiography. make clinical decisions based on the evidence they have gathered in order to develop a management plan for the patient and to involve the patients in this process. perform a range of clinical and practical skills safely the following list is indicative:- venepuncture, insertion of a cannula into peripheral veins, giving intravenous, intramuscular and subcutaneous injections, arterial blood sampling, suturing, cardiopulmonary resuscitation, basic respiratory function tests, administer oxygen therapy, use a nebuliser correctly, insert a nasogastric tube, perform bladder catheterisation. Prescribe Medicines with efficacy, safety and cost effectiveness. communicate clearly, sensitively and effectively with patients and their relatives, and colleagues from a variety of health and social care professions. communicate effectively with individuals regardless of their social, cultural or ethnic backgrounds, language skills or disability, this may include working through interpreters and/or advocates. communicate effectively with patients in difficult situations e.g. breaking bad news or dealing with difficult and violent patients. recognise and manage acute illness. care for people with recurrent and chronic illnesses and be aware of facilities for rehabilitation and palliative care. follow the principles of safe practice and risk management when they practice. respects the right of patients to be fully involved in decisions about their care, including the right to refuse treatment or to refuse to be participate as a patient for teaching or research purposes. Can deal with issues such as withholding or withdrawing life-prolonging treatment. responds to questions and ensures that patients have an opportunity to make informed decisions about their health and well-being. respects patients regardless of their lifestyle, culture, beliefs, race, colour, gender, sexuality, disability, age, or social or economic status. probity - graduates must demonstrate honesty. recognise the need to make sure that they are not prejudiced by patients' lifestyle, culture, beliefs, race, colour, gender, sexuality, age, mental or physical disability and social or economic status. what is meant by professionalism, its basis in morality, the reason for its existence, its characteristics ( competence, morality, altruism, promotion of the public good) and the obligations necessary to sustain it throughout their lives as doctors. 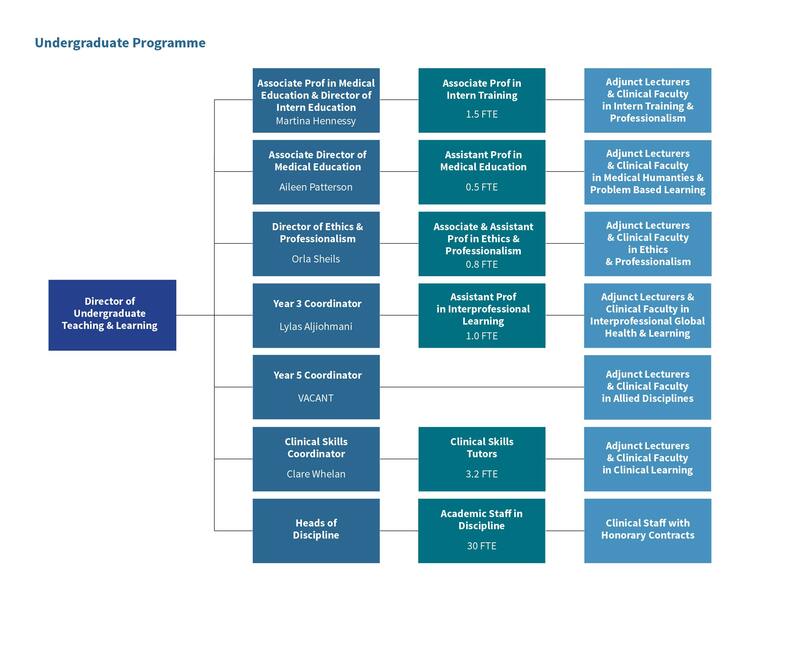 the range of continuing professional development opportunities available to ensure that they maintain high levels of clinical competence and knowledge. the principles of health service research including audit and how evidence is used to inform and improve future practice. the roles and expertise of other health and social care professionals. the working, organisational and economic framework in which medicine is practised in Ireland including government policy on health, patient entitlement to free treatment and the range of health insurance available. communicate effectively at individual, group and community level with respect to the issues related to medical practice. demonstrate effective team-working and leadership skills. understand the importance of privacy and confidentiality, when it is appropriate and how it is protected and maintained. maintain accurate and complete records having regard to confidentiality and legislation on Freedom of Information. identify their own learning needs. manage their own time and that of others. recognises personal and professional limits, and is willing to ask for help when necessary. accepts the moral and ethical responsibilities involved in providing care to individual patients and communities. recognise the duty to protect patients and others by taking action if a colleague's health, performance or conduct is putting patients at risk understand a range of social and cultural values, and differing views about healthcare and illness. 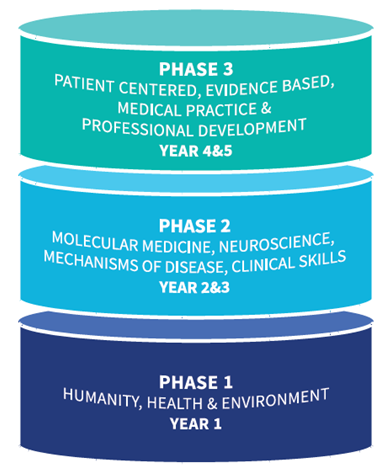 Three vertical themes; Biomedical and Clinical Sciences, Integrated Clinical Science and Practice and Professional Development and Clinical Competency are addressed. There is also a student selected component of practice is incorporated within each year. The programme is grounded in evidence based educational principles and learning theories that are relevant to developing the appropriate expertise, skills and self-awareness. Instructional methods reflect the mission to develop lifelong learners in developing understanding, mastering skills and fostering professionalism. These methods include problem-based learning, clinical skills and research skills teaching, ethical debates, bedside and clinical tutorials, self-assessment, use of logbooks, lectures and consultant clinics. The curriculum is delivered in accordance with principles of equality and justice consistent with the Trinity Inclusive Curriculum. Programme content may reflect one of three domains of Knowledge, Skills and Attitude. When teaching knowledge, we use a variety of methods such as lectures, seminars, workshops, case-based discussion and problem-based learning formats, peer learning, laboratory practicals, bed-side teaching, clinical demonstrations, clinical skills laboratory tutorials, field exercises and web-bases instruction, with the goal of getting the learner to actively engage in learning the material. Students are encouraged to take responsibility for their learning as they proceed through the programme. Student awareness of how they learn is promoted in the early years, using reflection in the PBL tutorials with tutor feedback, logbooks for the family case study where students describe their learning experiences, their strengths, and areas that require improvements. Students are responsible for identifying their own learning needs and are assisted in the process through appropriate tutor/mentor feedback. When teaching skills, we recognise the need to demonstrate the skill, supervise the student doing the skill, and later, when a degree of confidence and competence has been obtained, monitor how the skill is being performed in practice and provide feedback. 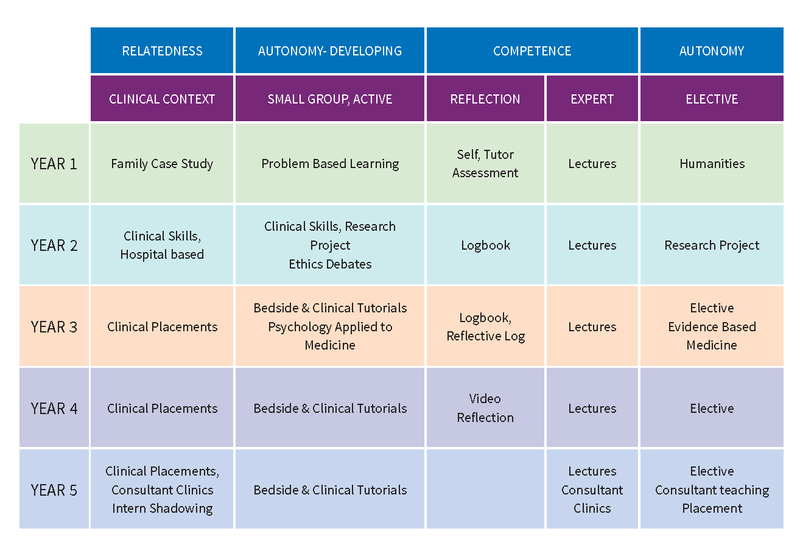 Competences are initially taught in a safe and supported environment such as a clinical skills lab, but later students’ progress to the real life clinical settings. When teaching about attitudes, we use methods that require the application of the attitude and values in relevant situations supported by the presence of balanced expertise and accompanied by time for assimilation. This is achieved through expert plenaries, workshops and a reflective assignment. Instructional methods also represent a continuum from lecturer participation and control to student participation and control. In this context, all the following are used: lectures, small group tutorials, project work, clinical work, research supervision, self-directed learning and private study. Assessment has a strong influence on student learning, in the undergraduate degree in Medicine, assessment is never considered in isolation but as an integral component of the learning process. A founding principle of curriculum design is that the learning outcomes, content, instructional methods and assessments are aligned appropriately to maximise student learning. Levels of performance are assessed as outlined in Miller’s competency pyramid, beginning with a working knowledge and progressing to work based practice. Knowledge, skills and attitudes are assessed at increasing levels of difficulty and complexity throughout the programme. 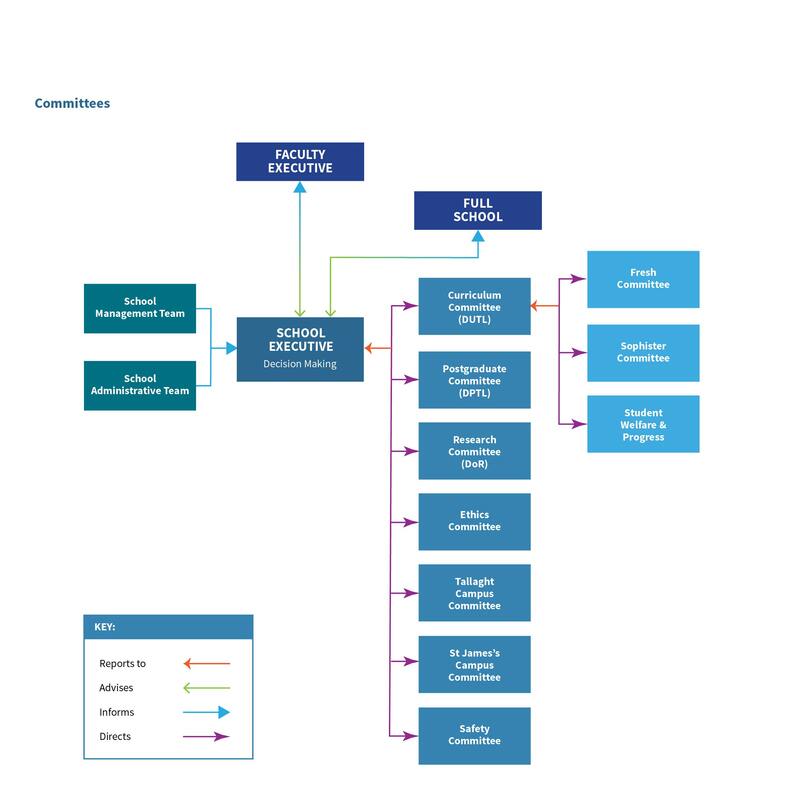 Figure illustrates the range of measurement tools across the 5-year programme. Formative and summative assessments used for student learning and summative assessment for student progression and graduation. Written assessments are mainly scheduled at two time points in the programme, in line with the university new academic structure. Clinical examinations and continuous assessments occur throughout the year, and are intended to provide feedback on student performance before a final clinical assessment such as an OSCE or high stakes patient based clinical examinations. Written and clinical assessments are criterion referenced, with the Angoff and/ or Ebel methods used for standard setting for MCQs and EMQs. OSCEs use a modified borderline regression method. Normative methods of standard setting, where a pre-defined percentage of students will pass/ fail are not permitted. Attitudes or behaviours are assessed by reflective diary, self-assessment, clinical reflection and observation of behaviour in clinical practice or attitudinal questionnaires. Review of ethical reflections with academic clinical ethicists are also employed to assess changes in attitudes. Professional insights, where students are given feedback on their ability to act on feedback are used in Year 4. They can also be explored on a one to one basis through elements such as the clinical reflection. The evaluation framework is an amalgamation of the Evaluation Cycle1 and Kirkpatrick’s Hierarchy of Evaluation2 as the underlying models for the process. 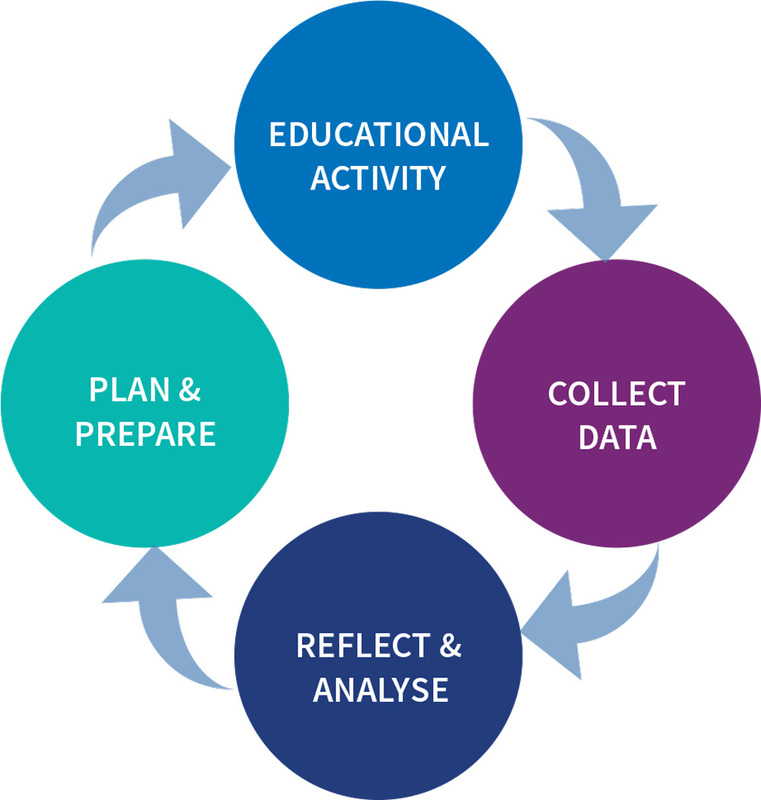 The Evaluation Cycle Model describes the educational intervention(s) being introduced, the method of data collection, the analysis process and concludes with recommendations being fed back to students and staff. The cyclical nature of the model permits a dynamic curriculum to be maintained. 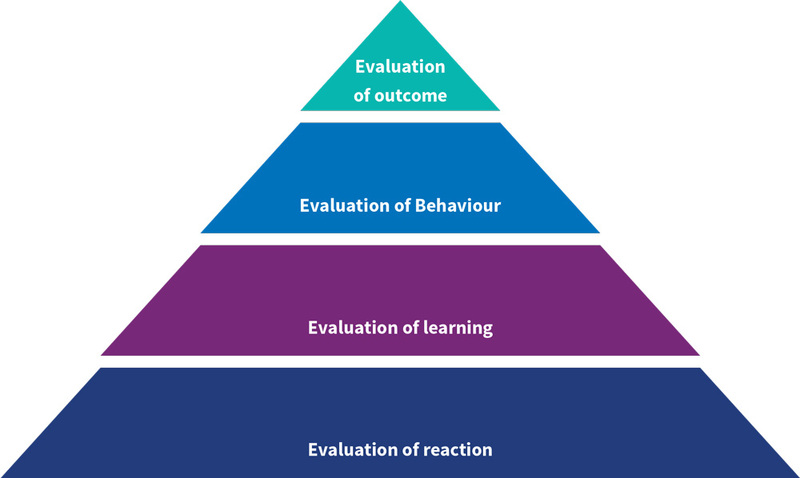 Kirkpatrick’s Hierarchy of Evaluation addresses the quality of the evaluation material collected, analysed and reported. The base level of the model, the student survey, concerns the overall quality of the course, specific modules and the educational environment. 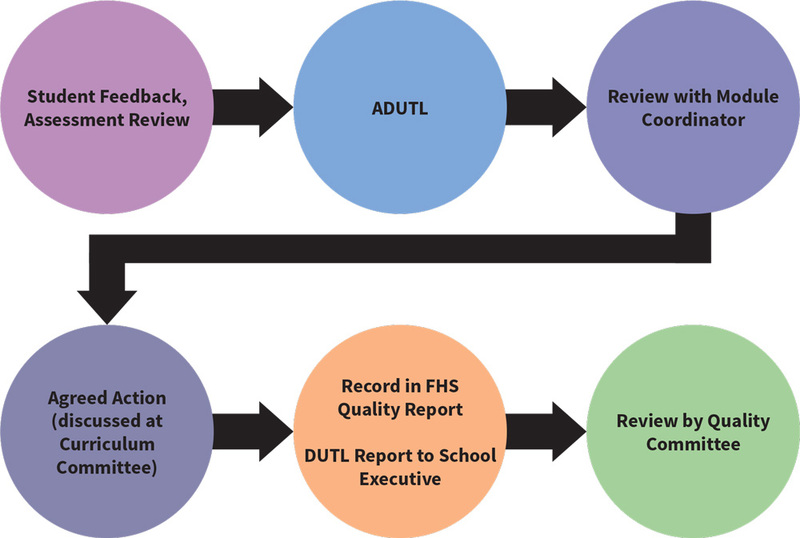 The evaluation of the subsequent levels regarding the achievement of learning outcomes (level 2) and competences (level 3) is incorporated in the School’s evaluation strategy. Level 2, is addressed through the review of student examination performance, and review of the external examiner reports on the appropriateness of the assessment. The final level is more difficult to measure and evaluates the practice of graduates. This can include a review of career choices of graduates and/or postgraduate performance and requires further development. The quality of the undergraduate programme is evaluated through multiple mechanisms of feedback which are triangulated to ensure a dynamic programme that responds to student needs. These mechanisms are described relative to stage of the evaluation cycle . Student feedback is systematically collected, collated and disseminated to individual module coordinators. 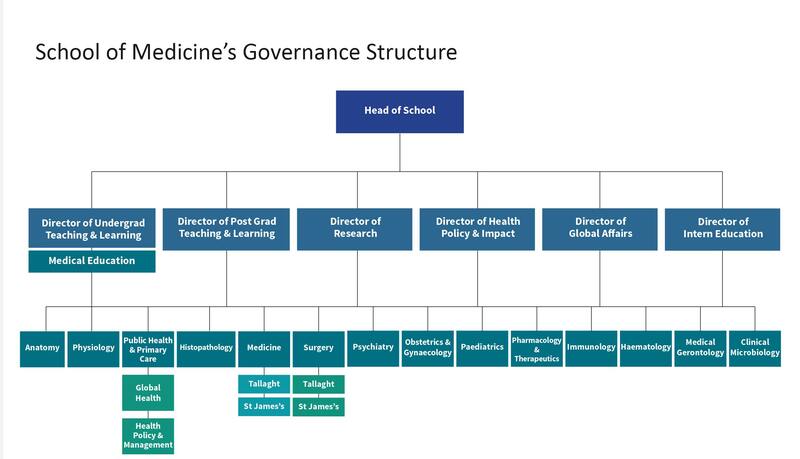 In an integrated programme, faculty work as a collective to ensure students achieve the graduate outcomes of the programme, individual autonomy is balanced with programme oversight through the relevant committees and DUTL. Feedback is considered in the totality of achieving the mission and educational outcomes of the programme. 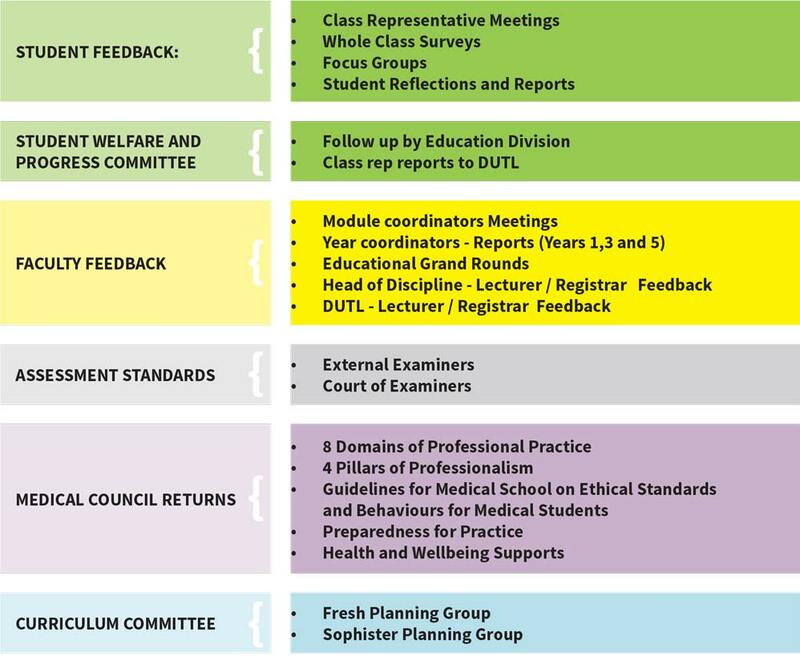 A culture of feedback has been fostered through collegial means and has harnessed the shared objectives of faculty to create a suitably responsive programme to student and stakeholder needs. The planning groups and curriculum committee function as a mechanism for staff feedback. Individual staff and students provide feedback regarding the course but it is in the context of the overall programme that individual contributors can be evaluated in a meaningful manner. The Pharmacology and Therapeutics, and Laboratory and Investigative Medicine modules build on material covered in the second medical year. There is increased clinical exposure and professional development through materia medica, Advanced Clinical and Professional Practice and Principles and Practice of Evidence Based Medicine and Elective Practice 1. The Hospital Attachments module begins with an introduction week and further develops the Clinical Skills that were covered in the second medical year. This year there is particular emphasis on various aspects of clinical medicine and surgery. Specialist clinical rotations take place in the third year. The fifth year modules reflect the culmination and integration of previous studies. Therefore, much of the teaching is integrated. There is a combination of acute care environments, clinical skills consolidation, intern shadowing, clinical attachments in both Medicine and Surgery (with beside tutorials, consultant clinics and small group seminars) lecture programme and an elective. This challenging and rewarding year provides graduates with a supervised and supported learning environment. The Intern Year is an essential step in transitioning from a graduate with a medical degree, to becoming a member of the Register of Medical Practitioners maintained by the Medical Council of Ireland. Interns have the opportunity to experience patient care through education, training and clinical responsibility, enabling the development of personal and professional competencies. From the beginning of the third medical year, students must attend hospital continuously. In addition to clinical rotations, students must also obtain credits by completing eight weeks of clinical elective posts in order to rise to the fifth medical year. These eight weeks of elective posts are carried out during the summers of 3rd and 4th Med, with students typically completing four weeks of electives after 3rd Med and another four weeks after 4th Med. Students may opt to break down the eight weeks differently, but a minimum of 2 weeks of electives must be completed each summer. It is the responsibility of each student to secure their summer electives and to submit the required elective evaluation forms at the end of each summer. During the first semester of 5th Med, students are required to carry out a further four weeks of clinical elective experience. This enables students to consolidate their clinical knowledge in a setting which will allow for escalation of responsibility in comparison to electives undertaken in 3rd and 4th Med. Students will take a core module in Clinical Research based in the Clinical Research Facility, St James's Hospital and concurrently follow one of six specialist tracks, which will be provided by the actual modules as offered by the currently running three Masters courses (i) the masters course in molecular medicine, (ii) the masters course in neuroscience, (iii) the masters course in bioengineering (iv) the masters course in immunology (v) the masters course in translational oncology or (vi) the masters course in healthcare infection management. Students will then conduct a three month research project and will submit a dissertation based on this project. Admission to this course is restricted to undergraduate students on year 3 (and occasionally year 4) in the School of Medicine in Trinity. At this point, students will have qualified for a B.A. which is normally awarded when the students are conferred with their final M.B. The intercalated Masters will also be conferred at this point. The course is coordinated through the Discipline of Clinical Medicine, TCD, St James's Hospital Dublin.